Even when our car drove up right beside them, the two monkeys sitting on the side of the road pretended to ignore us. The larger one continued to pick fleas off her smaller companion as she cast a surreptitious look our way. But on the whole the monkeys seemed untroubled by our presence. “It’s a mother and child,” our guide informed us. “Monkeys on the island don’t bother people because we don’t feed them,” was his explanation for the animals’ nonchalance. Mother and child Yakushika monkeys. Photo by Kazuya Nakamoto. We had come to Yakushima, a subtropical island off the southwest coast of Kyushu, which is famed for its temperate rainforests, ancient cedar trees and high peaks. A fifth of the island was named a Unesco Natural World Heritage site more than 20 years ago, in 1993. The island is home to Yakusugi, Japanese cedar trees that are more than 1,000 years old and are the main reason most people come to visit. 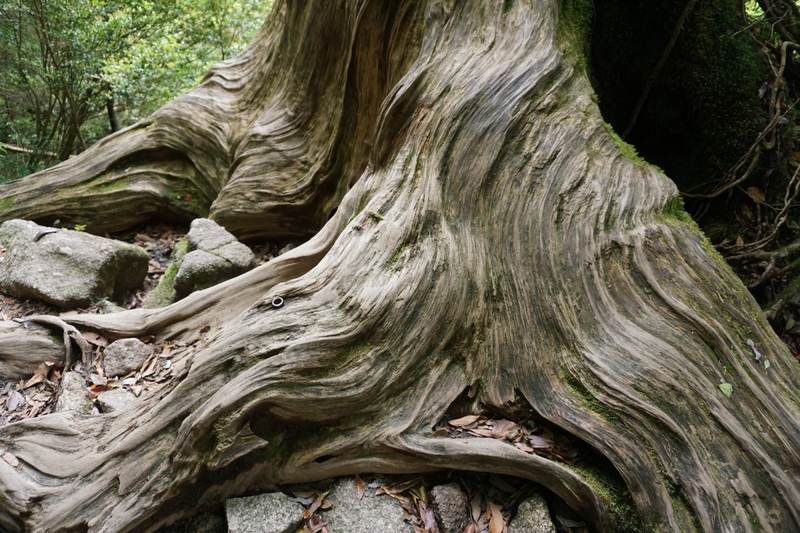 The ancient cedar trees on Yakushima were prized for their hardness and extensively logged during the Edo period (1603-1868). 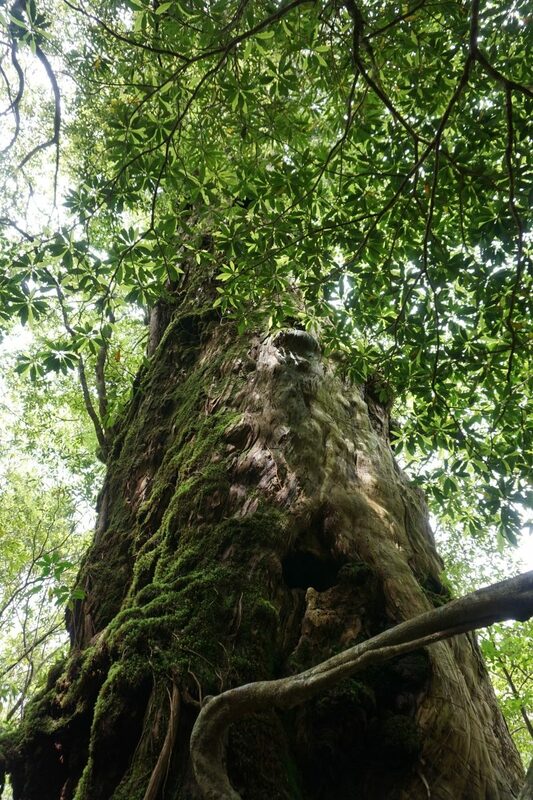 Yakushima is also home to banyan trees. 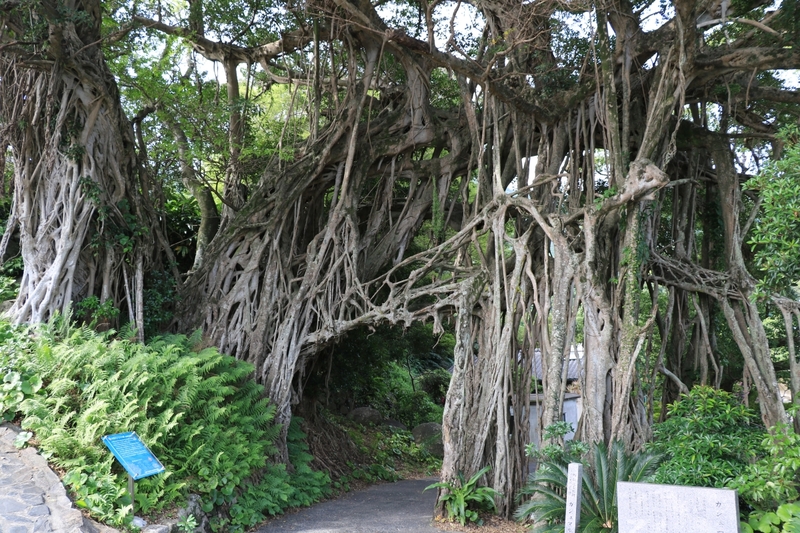 A massive banyan tree in Nakama on Yakushima’s southwest coast. Photo by Kazuya Nakamoto. 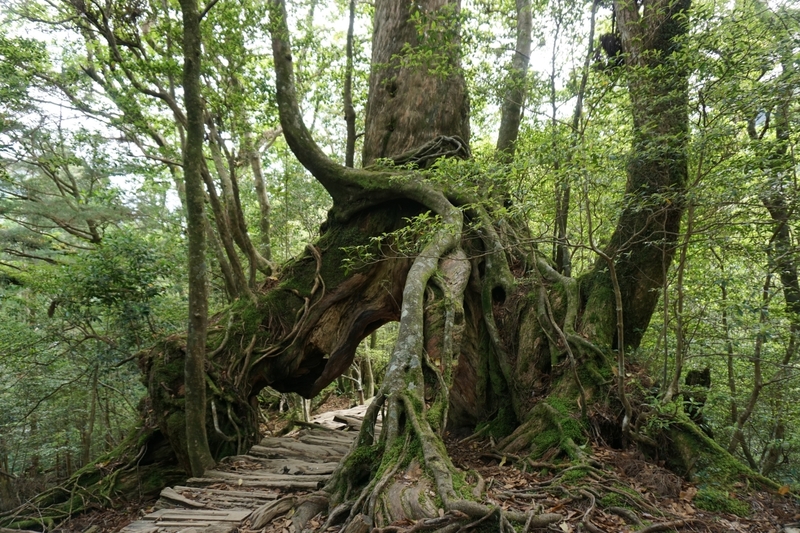 The Jomon Sugi, which takes its name from the Jomon period (circa 11000 BC to circa 300 BC) , is Yakushima’s biggest attraction and is thought to be between 2,000 and 7,200 years old. But even before we were able to set eyes on these ancient trees, we were captivated by the density of the forests that cover much of the island’s mountainous terrain. 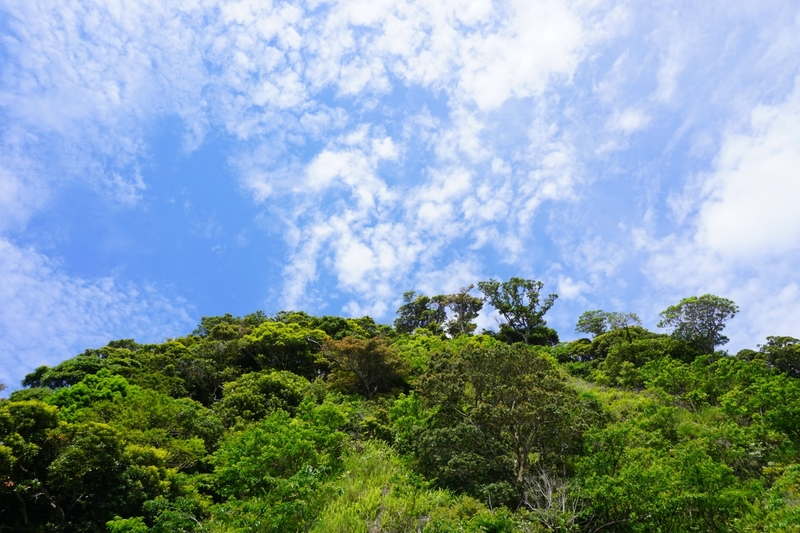 Lush, green mountains can be seen in many areas of Japan but the way the trees here are so closely packed together puts Yakushima’s forests in a different category. 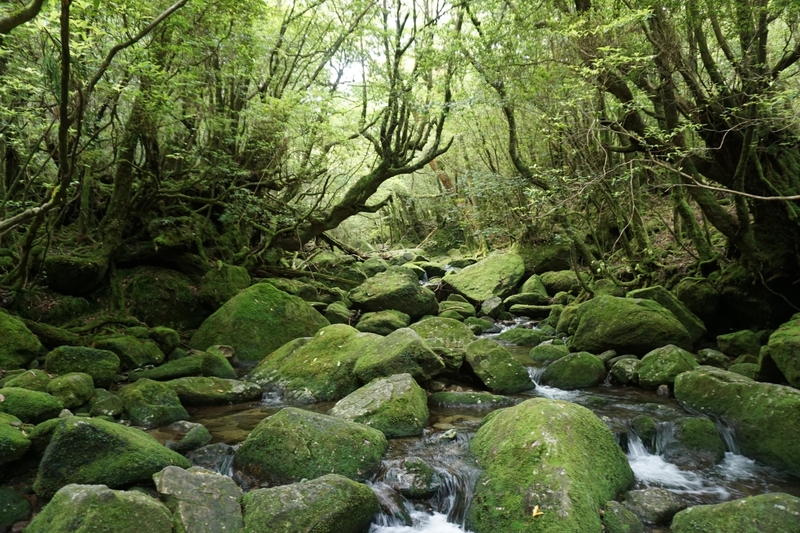 Yakushima is home to some 1,900 species and subspecies of flora, according to Unesco. 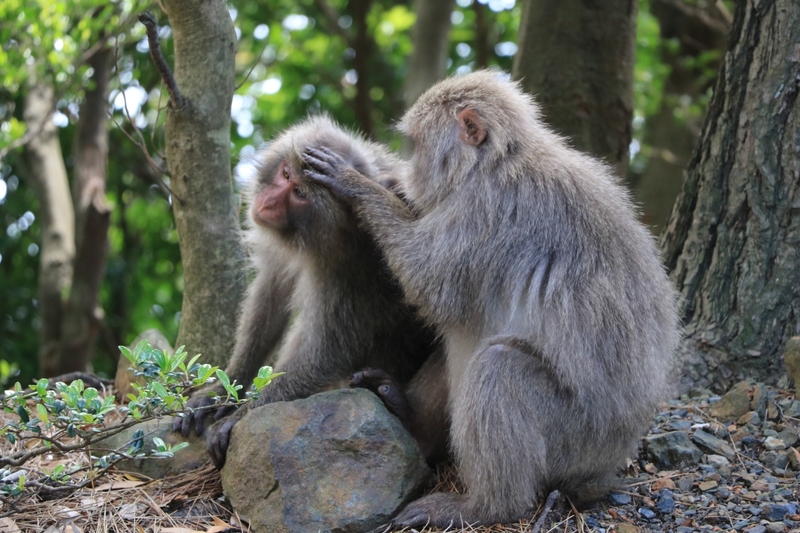 Among Yakushima’s many other striking features is the casual and frequent appearance of the island’s wildlife, such as the two monkeys we spotted on the roadside. In addition to more monkeys lounging in front of our hotel room and playing in the trees, we came across deer tramping through the bushes and even strolling at a more leisurely pace along mountain roads. One young buck we encountered was close enough to touch but too busy munching on leaves to even look our way. 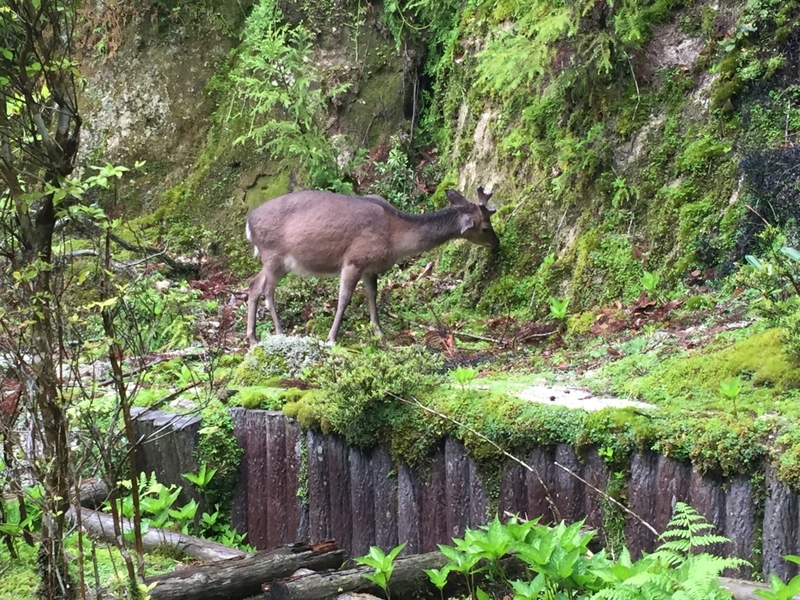 This Yakushika, or Yakushima deer, paid no attention to the crowd of tourists just a few meters away. It was once said that 20,000 people lived on Yakushima with 20,000 monkeys and the same number of deer. In reality, about 14,000 people live on the island today with about 5,000 monkeys and a similar number of deer. During nesting season from May to August it is also possible to spot endangered loggerhead sea turtles, which come ashore to lay their eggs on the white, sandy Inakahama beach, on Yakushima’s northwestern coast. The crystal clear waters of Inakahama beach. The turtles come to lay their eggs at night. Our four-day visit to Yakushima began with a drive around the almost perfectly round island, which took us north from the airport and then southwest along the Seibu Rindo Forest Path, an often narrow and tortuous road that twists and turns its way across the mountains. Seibu Rindo is said to be the only place in Yakushima where there are traffic jams. Cars get stuck there when deer come out on the road and refuse to budge – blithely unaware they are blocking traffic. Further south is Ooko-no-taki, Yakushima’s largest waterfall, where the water plunges 88 meters down a dramatic cliff. After our four-hour drive around the island, we were pleased to check into the Sankara Hotel and Spa, with its villas and main building perched along a mountainside with magnificent views of the ocean. 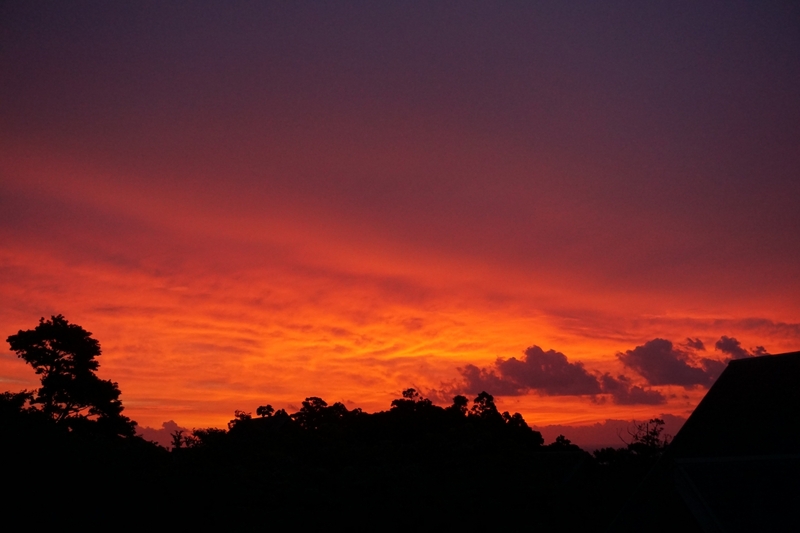 Sunrise as seen from our hotel room at Sankara Hotel and Spa. The friendly and helpful hotel staff make it easy to relax at Sankara. The same can be said of Yakushima in general, where there is an easy affability among the island folk. A chatty farmer sitting in front of a store during a break from planting rice, told us all about his problems with leeches. The proprietor of a small family-owned restaurant, which doubled up as their home, entertained us with stories of how she had been so busy the previous night that her foreign guests had volunteered to help her serve. Another pleasant surprise at the Sankara was the quality of the meals. The hotel’s main restaurant, ayana, serves western-style cuisine using as many local ingredients as possible. The spinach smoothie we had for breakfast one morning was unusual and so good I was sorry it was not served the following day. 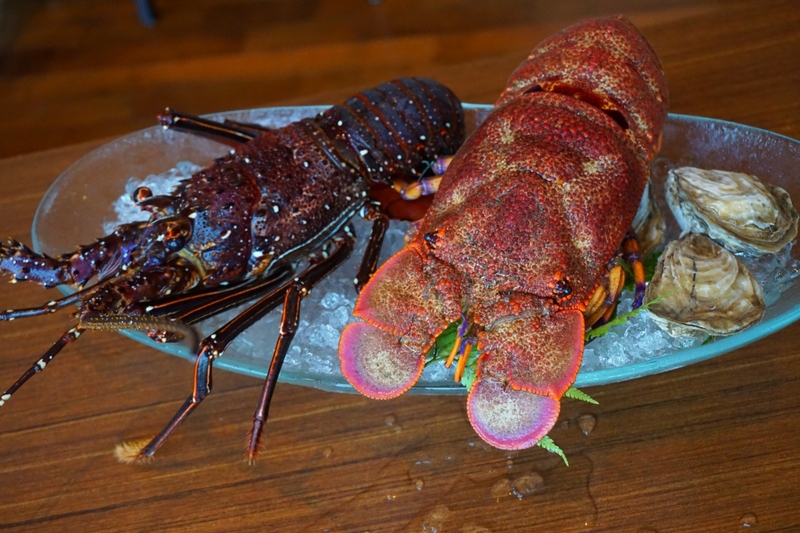 Lobsters caught that day were on offer for an additional fee at ayana restaurant. Dinner in the more formal okas restaurant, which costs an additional Y6,500 per person unless you are staying in one of the suites, was surprisingly light and excellent. 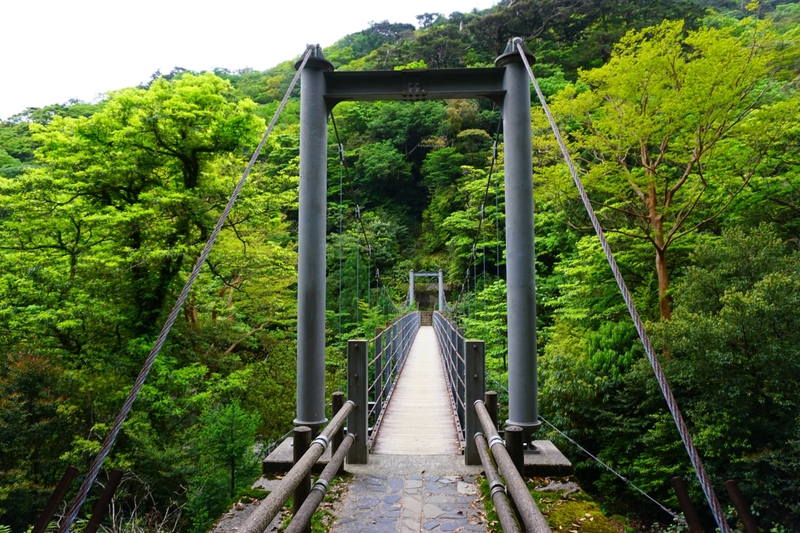 The most popular thing to do in Yakushima is to trek to the Jomon Sugi, a 10-hour journey that entails walking along a railroad track for most of the hike — a feature described by some who have made the trip as rather dull. We decided against making the trek, and instead hired a guide from a local company called Field to help us navigate several trails in the Shiratani Unsuikyo Ravine. 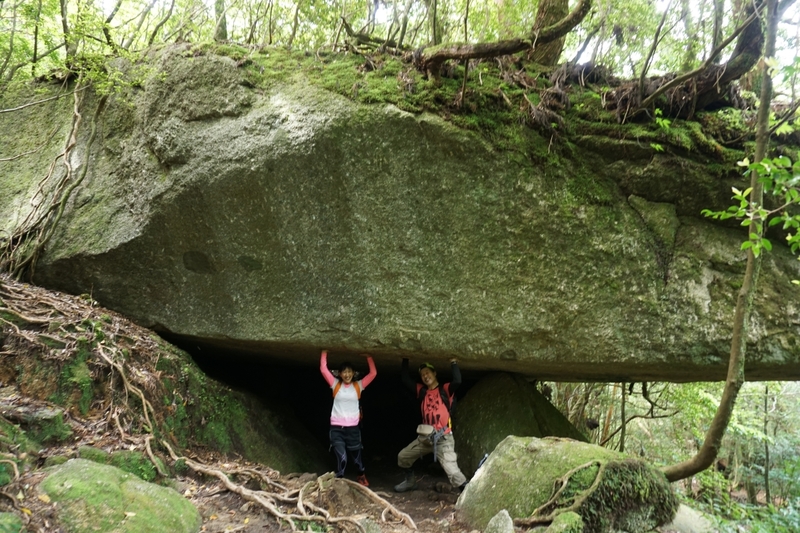 The 8-hour trek through this nature park, which is teeming with ancient Yakusugi that twist and turn their way over rocks, other trees and anything that gets in their way, was without a doubt the highlight of our Yakushima visit. A bridge at the entrance to Shiratani Unsuikyo Ravine. 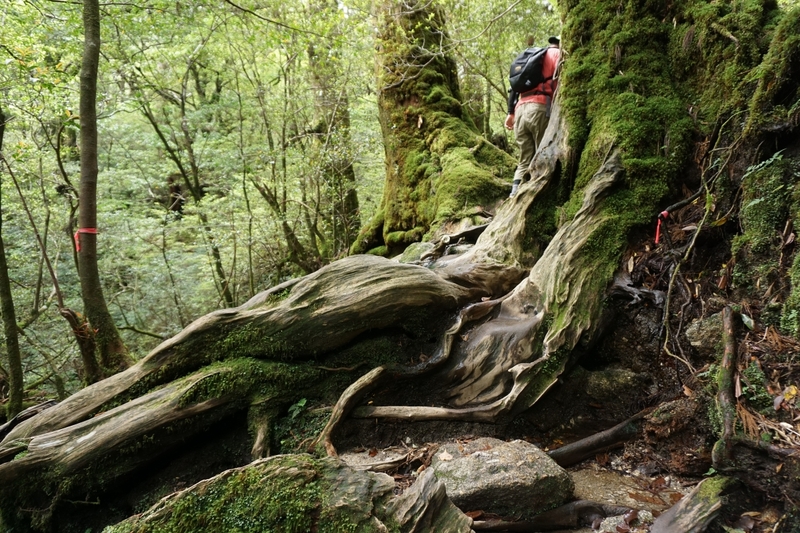 Although our hike was described by our guide as “a leisurely walk,” it turned out to be much more challenging than I had expected, with many steep steps up and down gnarled tree roots and moss-covered rocks. Undulating tree roots form a good part of the trail. Ohasahi-san, our guide for the day, leads us along a stone path. Many of the walkways were laid out by loggers during the Edo period (1603-1868). A tunnel formed by the roots of a cedar. 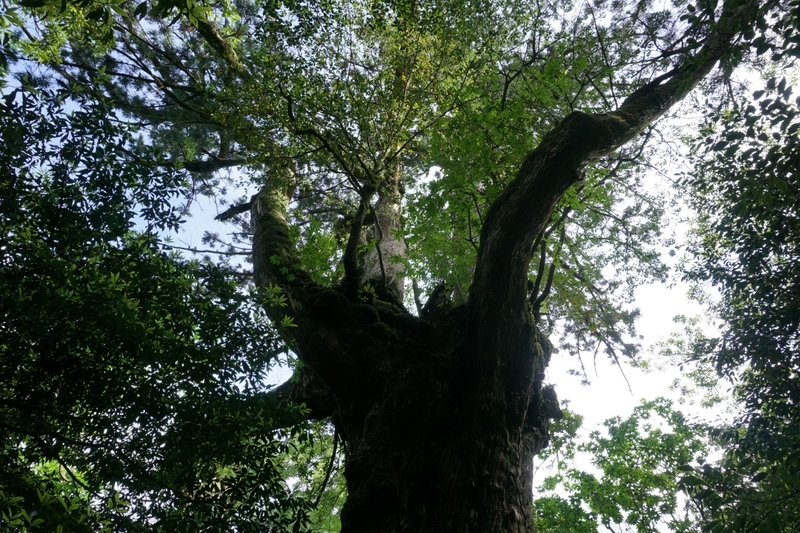 But the serene and mysterious beauty of the yakusugi trees, many of which are thousands of years old, drew us further and further into the ancient forest, making the trek feel less time-consuming and arduous than it actually was. A tree root weathered by time. A cedar reaching for the sunlight. 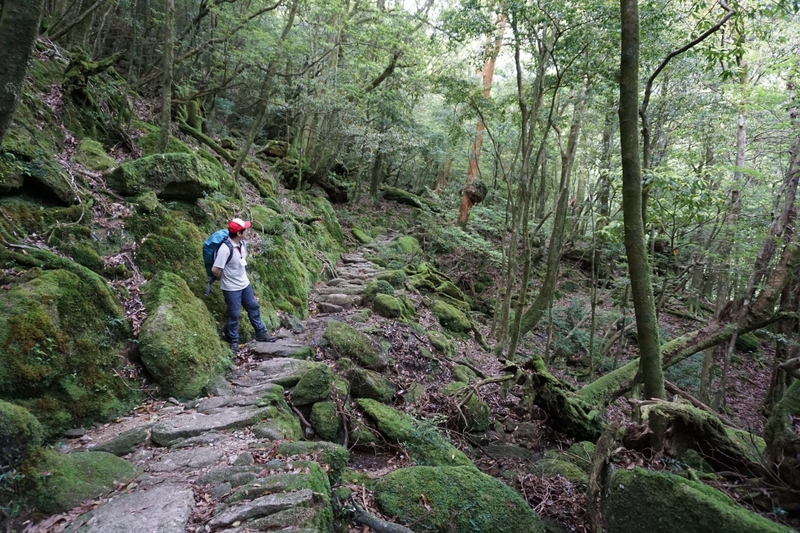 Moss-covered rocks are often the only way across the many streams in Shiratani Unsuikyo. But they aren’t as slippery as they look. The trees will even grow on rocks. By the time we returned to the hotel, I was already starting to feel aches in my legs (yes, our guide had warned me that I was walking too purposefully and thereby putting unnecessary strain on my calves, but I was wary of slipping on some moss or tripping over an extended tree root). Thankfully, we had a free morning the next day, which allowed us to rest our muscles a little more before our next adventure – kayaking on the Anbo River. We paddled up the river and back, stopping to land on a sandbank to look for some of the river’s inhabitants, such as the smallest shrimp I have ever seen, and to admire the peaceful scenery. So far, we had been fairly lucky with the weather. 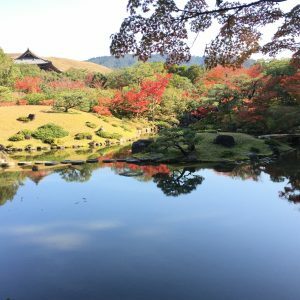 But, locals say it rains 35 days a month and sure enough, our luck ran out on the last day of our visit when we went to see the 3,000-year old Yayoi Sugi. 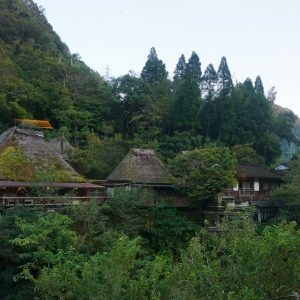 Although it was dark but dry when we left the hotel that morning, rain came pelting down once we had made the tortuous journey up the mountain to where the magnificent Yayoi Sugi stands. Towering 26.1 meters high and with a circumference at shoulder height of 8.1 meters, the Yayoi Sugi has a commanding presence. 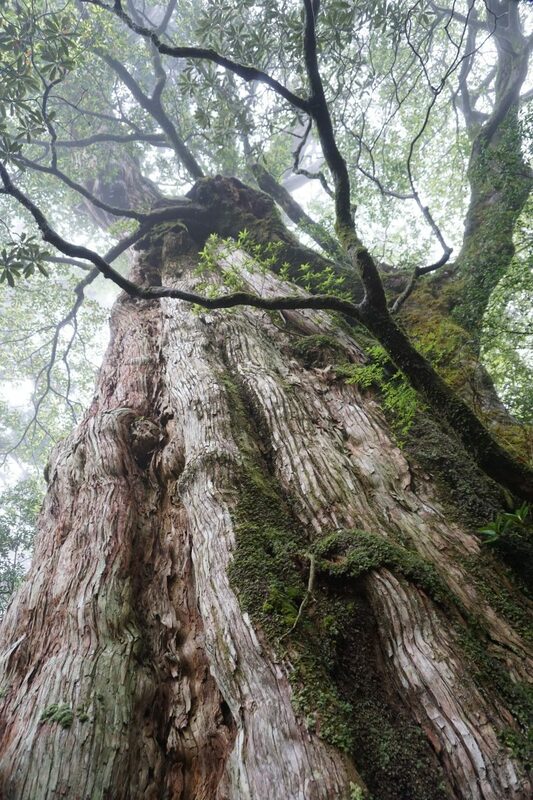 Yayoi Sugi is one of the oldest cedar trees in Japan. 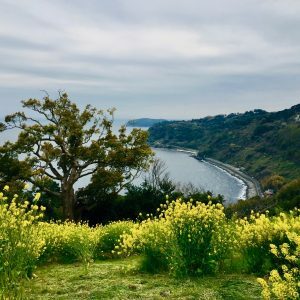 From the Yayoi Sugi, Yakusugi Land, which is not a theme park but a nature reserve with several, easy hiking trails and plenty of centuries-old cedar trees, is just a short drive away. Although we had half expected Yakusugi Land to be underwhelming compared with Shiratani Unsuikyo, it did not disappoint, even though we chose not to undertake the longest hike, given the rain. Yakushima is a small island that can be toured in a few days. But the pristine beauty of the place, the abundance of wildlife and the easy friendliness of the people are bound to make you want to come back for more. From Tokyo fly to Kagoshima and then take a JAC propeller plane to Yakushima. There are also direct flights from Osaka (Itami Airport) and Fukuoka. 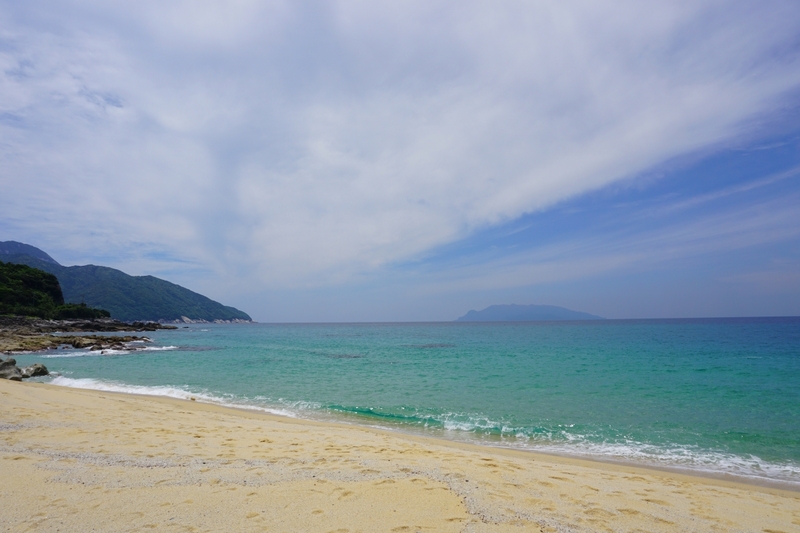 It is also possible to take a high-speed boat from Kagoshima port to Anbo or Miyanoura ports on Yakushima.